LOS BAÑOS, Philippines—Delegates from the Ho Chi Minh University of Culture (HCMUC), led by Le Thanh Hai, senior lecturer at the Faculty of Media and Communication, and representatives from the International Rice Research Institute (IRRI) recently discussed potential institutional partnerships, particularly in the area of climate change communication. The university offers programs in journalism, tourism, museum management, information-library management, culture management, folk culture, cultural studies, traditional culture, and Asian culture. Dr. Hai’s group expressed keen interest in disseminating information on climate change to the Vietnamese people, especially those in the Mekong Delta region, through innovative campaigns, cultural activities, and local and mass media. In doing so, they hope to engage the locals to take action and address this important global issue. The Mekong Delta region in southern Vietnam is now facing its most severe drought in nearly a century and its water level is reportedly at its lowest point since the late 1920s. The below-average rainfall in recent months has caused water shortages, a decline in agricultural production, and increased salinity in irrigated fields. IRRI has long been conducting research projects in Vietnam and has developed a wide range of technologies and practices that could help farmers in the Mekong Delta better adapt to the impacts of climate change. IRRI also hosts the CGIAR Research Program on Climate Change, Agriculture, and Food Security (CCAFS) in Southeast Asia, which has established three Climate-Smart Villages (CSVs) across Vietnam. At this point, it is vital that the rich research outputs from IRRI and CCAFS reach the Vietnamese farmers so they could actually benefit from these. CSVs are villages located in different ecosystems and experiencing various climate challenges. These are farming communities where local actions and convergence of initiatives are carried out to increase farm productivity in a sustainable way, improve climate resilience (adaptation), in ways that would reduce greenhouse gas emission from the farming systems (mitigation). Ms. Corinta Guerta, IRRI director for external relations, proposed that HCMUC should align its information dissemination activities and promotional and awareness campaigns with the research activities being undertaken by IRRI and CCAFS. In August, HCMUC, along with other agricultural universities in the area, will be organizing a student congress. The congress will be a venue for students to share and discuss their ideas and understanding of the CSV concept and some activities in the CSVs in Vietnam that CCAFS SEA is overseeing. Dr. Hai considers this as a culminating activity where their students will present in various creative forms and medium, the ideas and outputs from science-based materials that will be shared by IRRI and CCAFS. Other short-term activities suggested during the meeting included the translation of a CCAFS SEA-supported guidebook on climate change for Philippine journalists. The guidebook could be translated into Vietnamese and then be contextualized in local scenarios. IRRI, CCAFS, and HCMUC can also jointly publish and produce other information materials for Vietnamese audiences. Collaboration in the areas of training and other capacity-building activities will also be explored. New York, USA—The United Nations Environment Program (UNEP) has organized an exhibit that showcases climate change mitigation stories around the globe through compelling photo essays. The exhibit runs from 22 April to 12 May at the UN Headquarters in New York. Part of the exhibit focuses on rice and climate change, which acknowledges the work of the International Rice Research Institute (IRRI) in reducing greenhouse gas (GHG) emissions from rice farming systems through the alternate wetting and drying (AWD) technology. The exhibit was shown previously in Paris during the COP21 climate change negotiations in December 2015. With the theme, We have the power: We are the change, the exhibit, which opened on Earth Day on 22 April, was intended to coincide with the momentous Paris Charter Agreement, on which 174 States and the European Union have signed. This signifies each country’s commitment to keeping global temperature increase within this century well below 20C. Doing this within the coming decades would mean reducing GHG emissions from various industries and sectors. With the global GHG emission from agriculture now estimated to be at 10–12%, rice-producing countries need to effect measures to reduce emissions from rice cultivation, particularly the potent methane gas (CH4). The IRRI-developed AWD technology has been proven to effectively address multiple challenges due to climate change, such as diminishing water resources and GHG emissions in rice production. Through AWD, rice paddies in irrigated systems need not be continuously flooded, which is the practice in the conventional system. This intermittent series of flooding and reflooding of rice paddies results in water savings of up to 30%, thus providing more income to rice farmers by reducing irrigation costs. This technology also reduces methane emission from rice farming by up to 50%, which helps hold down the increasing global temperature. Through the IRRI project on methane mitigation in rice paddies, AWD is now being tested and evaluated for its technical suitability and socioeconomic benefits in countries such as Vietnam, Bangladesh, Thailand, and the Philippines. Activities to determine the ways and potentials for outscaling (massive technology adoption) and upscaling (mainstreaming to national development plans) are being conducted in Vietnam and Bangladesh. A project funded by the Agriculture Initiative of the Climate and Clean Air Coalition (CCAC) being hosted by UNEP, with support from the CGIAR Research Program on Climate Change, Agriculture and Food Security (CCAFS), is identifying opportunities for policy support and testing new scale-out models. As an old adage goes, “a picture paints a thousand words.” Through this exhibit, it is hoped that the photos on display will be able to meaningfully communicate that we have the power to help mitigate climate change and global warming. With good science, committed efforts, and solid action on the ground, we can achieve the change that we aspire for. 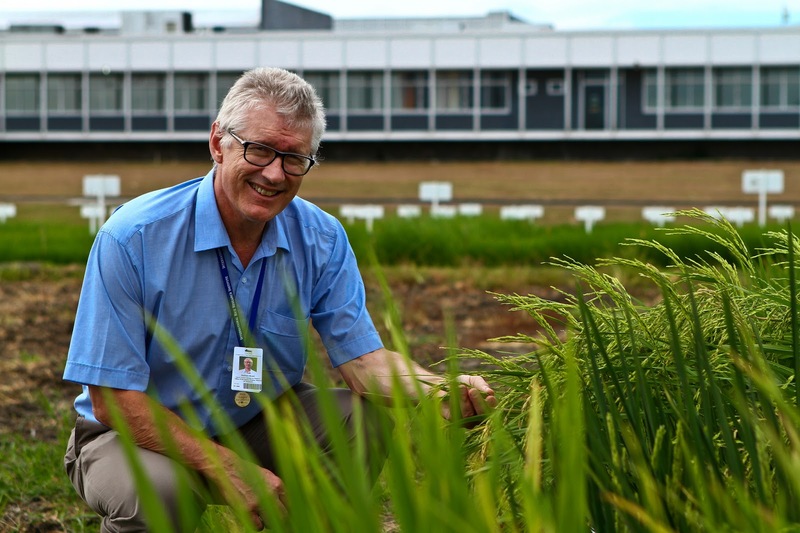 HAMBURG, Germany—One of the world’s foremost organizations in the field of cereal science and technology has recognized the achievements of Matthew Morell, director general of the International Rice Research Institute (IRRI). The executive committee of the International Association for Cereal Science and Technology (ICC) Academy selected Morell to be a Fellow for his scientific work in biotechnology related to cereal grains and his research management in rice. The ICC Academy provides recognition to individuals who have made significant contributions to the work of the ICC and the furtherance of its aims and ideals and to the profession of cereal science. Its standard award is the ICC Fellowship. Fellows in turn provide scientific guidance to ICC conferences and other activities. Morell’s Fellowship was announced during ICC’s 2016 Congress, 18-21 April in Germany. LOS BAÑOS, Philippines—Researchers from six member countries of the Coalition for African Rice Development (CARD) are attending the Quality Breeder and Foundation Seed Course to develop their technical capacity for improving the rice seed value chain. Sixteen participants (photo) from Ethiopia, Kenya, Mozambique, Rwanda, Tanzania, and Uganda and one participant from Nepal are attending the three-week course (26 April-13 May) at the Training Center of the International Rice Research Institute (IRRI). The group will be introduced to the principles and crop management practices needed to produce breeder and foundation seeds in different rice ecosystems. They will also study postharvest practices and seed processing activities to lessen contamination and optimize the quality and quantity of breeder and foundation seeds. The course also covers standard procedures and modern techniques used along the rice seed value chain. The opening ceremony was led by Kenji Terada, first secretary, agricultural attaché of the Embassy of Japan; Yuko Tanaka, senior representative of the Japan International Cooperation Agency (JICA) Philippine office, Noel Magor, head of the Impact Acceleration Unit and Training Center, and Matthew Morell, IRRI director general. Also in attendance were Corinta Guerta, IRRI director for external relations; Jason Beebout, IRRI-JICA project leader; Kumiko Ogawa from the JICA Philippine Office; and Lea Abaoag from the Philippine Rice Research Institute. The course was developed by IRRI in collaboration with JICA. Now in its second phase, the IRRI-JICA collaboration is part of the Extension Capacity Development for Rice Food Security in Africa that aims to amplify the impact of rice research through capacity building and the development of the seed sector. For more information on IRRI-JICA collaborative training courses, please send an email to JICATraining@irri.org. LOS BAÑOS, Philippines—IRRI Duets, a singing competition and fundraising event all in one, has proven once again that the institute is not only home to outstanding scientists but also to talented individuals who can make beautiful music. The sold-out, standing-room-only event held on 21 April is one of the projects of the Society of IRRI Non-research Professionals (SINoP). The talent competition raised donations and ticket sales that will go to SINoP’s scholarship program. Now on its fifth season, nine duos from various IRRI units showed off their harmony, singing prowess, and artistry to win the coveted title. Larise Gallardo and Gio Karlo Evanglista, representing the Plant Breeding and Crop and Environmental Sciences Divisions, came in second. (View video.) Placing third was Maria Ymber “Mayee” Reveche, from Plant Breeding, and Rudi Trijatmiko, from the GSL-Genotyping Services Laboratory. Rveche and Trijatmiko also won the People’s Choice Award. (View video.) All the winning duos received cash prizes and trophies. Gracing the event were celebrity judges Mackie Cao, a semi-finalist of The Voice Philippines Season 2 and Eat Bulaga’s Just Duet, and Tony Lambino, former member of the Smokey Mountain singing group and former head of IRRI Communication. Ms. Marife Rebutar-Maquera, from UP Rural High School and winner of 2012’s UPLB Outstanding Artist in Music, chaired the board of judges. Special performances were given by Cao and Lambino while IRRI Duets’ Season 4 champions Jenny Wassmann and Cydhar Racho showed the audience why they topped the competition in 2013. Wassmann and Racho were accompanied by the IRRI Choir including Elizabeth "Libby" Pulsford, wife of IRRI Director General Matthew Morell. Also on hand were Geisha Shaina Lyn Sanchez, 2014 Dancing with the IRRI Stars winner, Maila Melodillar (Training Center) and Khelan Parojinog (Security Office) who regaled the crowd with their terpsichorean number. All winners and contestants of IRRI Duets Season 5 take center stage with IRRI DG Matthew Morell and SINoP officers. SINoP thanks all the donors, supporters, and the team who made the fund-raising activity a huge success. TRIESTE, Italy—The Third World Academy of Sciences (TWAS) has selected Dr. J.K. Ladha (photo) to be one of two recipients of its 2015 TWAS prize for outstanding contributions to the agricultural sciences. The TWAS prizes are annually awarded to scientists and engineers in nine different categories whose efforts have had a significant impact in the developing world. Ladha, a soil scientist and agronomist at the International Rice Research Institute (IRRI), is being honored for his development and promotion of conservation practices in the rice-wheat system of South Asia. He is sharing the 2015 prize in this category with LI Feng-Min of China. Ladha’s work, in collaboration with many of IRRI’s national partners, takes a holistic, systems approach that covers various components of agronomic, soil, and water management. Through his research, several integrated crop and resource management technologies have been adopted to help resource-poor farmers, according to the Agriculture and Food Security Center of Columbia University. Ladha has received various international accolades including the 2015 International Service in Crop Science Award from the Crop Science Society of America. He is a fellow of the American Association for the Advancement of Science, the American Society of Agronomy, the Soil Science Society of America, and the Indian Academy of Agricultural Sciences. Founded in 1983 and based in Italy, TWAS is the World Academy of Sciences for the advancement of science in developing countries. The major objectives of TWAS are to recognize, support, and encourage the pursuit of science excellence in developing countries. TWAS annually recognizes individual scientists from developing countries in recognition of their outstanding contribution to knowledge. TWAS prizes are awarded in nine fields: agricultural sciences, biology, chemistry, earth sciences, engineering sciences, mathematics, medical sciences, physics, and social sciences. Each TWAS Prize carries a cash award of USD15,000. The winners will lecture about their research during TWAS's 27th General Meeting in Rwanda in November 2016, when they will also receive a plaque and the prize money. LOS BAÑOS, Philippines—The world’s leading rice research institute has renewed its call for stronger partnership with all rice-growing countries, particularly across Asia. 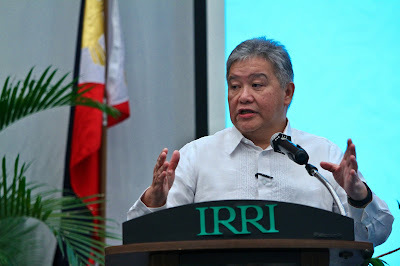 “It is high time for Asia’s rice producers to not only benefit from the results of scientific rice research,” said Dr. V. Bruce J. Tolentino, deputy director general for communication and partnerships at the International Rice Research Institute (IRRI). “The rice-growing countries should also invest in the research that they benefit from." Although 90% of all rice is produced and consumed in Asia, it has been primarily western countries that have been footing the bill for IRRI’s rice research since it was established in 1960. IRRI’s partnership strategy focuses on elevating the discussion to the Asian countries, which have been the principal users and beneficiaries of the technologies that the institute has developed over the years. LOS BAÑOS, Philippines— Extension professionals, researchers, and farmer leaders from seven Asian countries attended two weeks (4-15 April) of rigorous training (photo) conducted by the Rice Science Academy at the International Rice Research Institute (IRRI). In cooperation with IRRI's Postharvest Unit, the training course, Rice: Post-Production to Market, was designed for the participants to learn about different postharvest technologies that can help reduce grain losses and increase a crop's market quality. The course consisted of exercises and classroom discussions about assessing rice quality as well as actual manual and mechanical postharvest operations (harvesting, threshing, drying, milling, and storage). 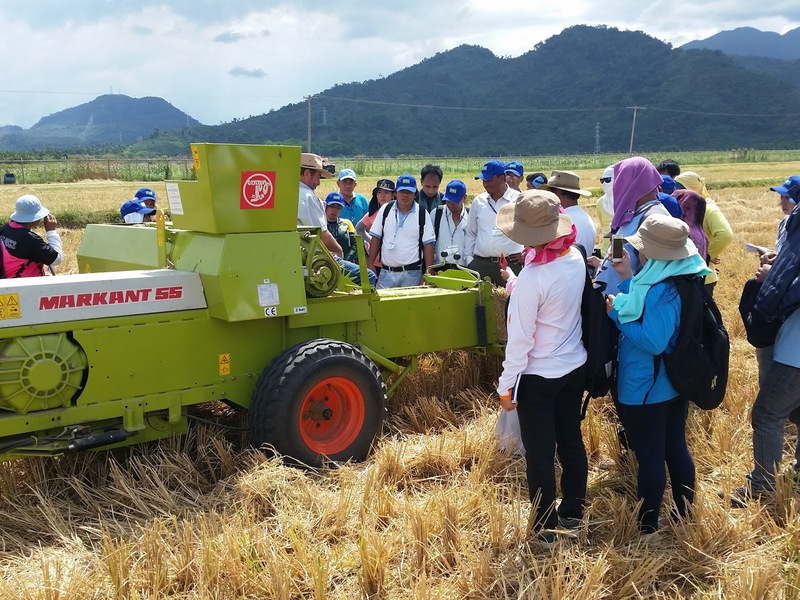 The participants visited rice mills, farming communities, and government and private institutions to get a holistic understanding of postharvest processes and how they affect the quality and market value of rice. Rice markets and business models were presented to reinforce an understanding of the rice value chain and help determine the opportunities to introduce suitable postharvest technologies in different farming communities. A certification exam gauged the participants’ skills and knowledge acquired during course and to ensure that they can now make informed decisions in measuring losses and identifying appropriate postharvest technologies to reduce losses in their respective countries. In addition to Nepal and Indonesia, participants came from Bangladesh, Malaysia, Myanmar, Thailand, and the Philippines to attend the course facilitated by Rickman and Martin Gummert, head of IRRI’s Postharvest Unit. The Young Researchers' Lunch for April hosted Dr. Karen Moldenhauer (at right center in photo), a new member of the Board of Trustees of the International Rice Research Institute (IRRI). A professor of Crops, Soils, and Environmental Sciences at the University of Arkansas, she holds the university's Rice Industry Chair for Variety Development. Dr. Moldenhauer has conducted applied research in rice breeding. During her tenure as project leader for the rice breeding and cultivar development program at the University of Arkansas, 28 rice cultivars have been released to producers, which have had a substantial impact on rice production in the U.S. state. Dr. Moldenhauer discussed her breeding strategies for selecting plants based on their promising appearance rather than keeping only the plants that fit the specified trait criteria. She also explained her approach to improving the purity of breeder's seed by preserving some of the original material in cold storage for later distribution. Luncheon participants included Arnel Pocsedio, Lenie Quiatchon, Erwin Tandayu, Aubrey Fabro, Subir Bairagi, Kouassi Amani, and Xiaoqian Wang. LOS BAÑOS, Philippines – A new seed laboratory has opened at the International Rice Research Institute (IRRI). It will increase the capacity and speed at which seeds are prepared for entry into the International Rice Genebank, where the germplasm of more than 127,000 rice varieties from around the world are kept for conservation, scientific research, and breeding purposes. The Genetic Resources Seed Processing Laboratory (GRSPL) opened on 13 April 2016, with H.E. Thomas Ossowski, ambassador of Germany to the Philippines, cutting the ribbon and unveiling the marker with Jim Godfrey, OBE, chair of the IRRI Board of Trustees, and Matthew Morell, director general of IRRI. LOS BAÑOS, Laguna—The International Rice Research Institute (IRRI) and Philippine National Railways (PNR) have formally agreed to continue collaboration to ensure a clear right-of-way for the Southern Railway line passing through IRRI's Zeigler Experiment Station on the campus of the University of the Philippines Los Baños (UPLB). The line is part of railway improvements under the planned North-South Railway Project (NSRP). plan to construct a railway that will pass through IRRI. The NSRP includes the upgrading of the tracks and the establishment of a train depot and station at Los Baños, at a site currently part of the area leased to IRRI by the University of the Philippines system. The train depot, which reportedly might begin to be constructed sometime in the first half of 2017, is expected to take at least four years to complete. The station will serve as the main southern terminal of the commuter line running from Tutuban in Manila to Los Baños. "At peak operation, there will be a train coming from Manila to Los Baños every 10 minutes," said Mr. Joseph Allan Dilay, PNR general manager. "Besides the daily commuter rail service, the NSRP will also develop and eventually offer a long-haul rail service from Manila to Matnog in Sorsogon, Bicol, and this would include new tracks and trains." Transportation Secretary Joseph Emilio Abaya explained, when bidding for the NSRP commenced last year, that the project will impact directly those at the grassroots level. "Those who have less in life, especially farmers and fisherfolk, will be given efficient means to expand their livelihood. This is our biggest project yet and it is for those who need it the most," he said. Mr. Abaya underscored how a country's rail system is a driver for inclusive economic growth because it encourages trade and business activity and provides access to employment and educational opportunities. Thus, the reason why PNR—once a symbol of the country's economic progress—should be modernized into a safe, convenient, and efficient system. Dr. Tolentino said that IRRI respects the Philippine Government's plans and will adjust accordingly. "We just need to know in advance so that if any adjustments are needed, we will have adequate time to make them in our research program and associated investments," he said. "Once a rice experiment is in the ground then it must stay there until completion," he explained. "Research requires infrastructure, which will be affected by the Government's plans." Some of the Madrid Fusion Manila participants take a break from their many activities. 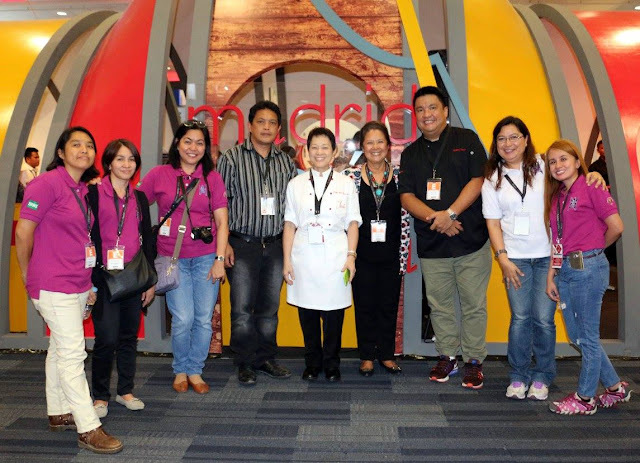 PASAY CITY, Philippines, 7-9 April—The heirloom rice of the Cordillera Region again attracted international attention at the world’s most prestigious gastronomic congress, the 2016 Madrid Fusion Manila. Chefs and food aficionados from all over the world gathered for the annual event at the SMX Convention Center. With this year’s theme, The Manila Galleon: East Meets West, the event celebrated gastronomic finds from across the globe including the traditional rice varieties found only in the Philippine provinces of Ifugao, Mountain Province, Benguet, and Kalinga. The rice varieties were featured at the booth of the Heirloom Rice Project (HRP), a joint venture of the Department of Agriculture (DA) and the International Rice Research Institute (IRRI). The booth presented the country's indigenous products, not only to increase global awareness, but also to show the potential role of the heirloom rice industry in improving the lives of Cordillera farmers’ and in conserving their heritage. This is the second time HRP participated in Madrid Fusion Manila and, like during the previous congress, the pigmented rice varieties attracted the attention of local and international audiences. Among them were local and international restaurateurs who showed keen interest in including heirloom rice in their menus, chefs who are on the lookout for new ingredients, and heads of food companies who are seeking to diversify their products. The rice likewise drew food bloggers and writers, health advocates, government representatives, students, and senior citizens. 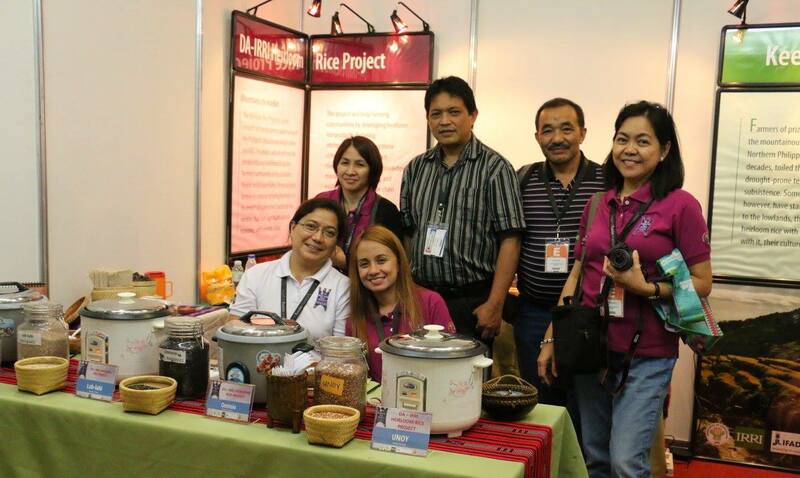 HRP team members ran the booth, which included displays of the Lab-labi, Ominio, and Unoy rice varieties for sample tasting. The HRP team, led by Drs. Casiana Vera-Cruz and Digna Manzanilla, offered visitors samples for tasting of varieties Unoy, Lasbakan, Lab-labi, Chorchor-os, Ulikan red, and Ominio. In addition, IRRI’s Dr. Ana Cope, Ms. Pauline Capistrano, and Ms. Lucy Samadia also provided additional information about the unique characteristics and nutritional benefits of these unique varieties. Mr. Ceferino Oryan, municipal agriculturist of Barlig, Mt. Province, and Mr. Ruben Dulagan, of the DA-CAR’s Agribusiness and Marketing Assistance Division, helped sell the heirloom varieties on behalf of the farmers who produced them. “Congress participants were curious about both the taste and feel of the rice as much as they were interested in how they can contribute to improving farmers’ livelihood and welfare,” said Vera-Cruz. On the second night of the Madrid Fusion, Robby Goco, the acclaimed executive chef of Cyma and Green Pasture restaurants in Manila, prepared a rice salad using Chorchor-os and a parsley black salad using Ominio for his cooking demonstration. Meanwhile, Chef Jessie Sincioco, president and CEO of the 100 Revolving Restaurant and Chef Jessie Rockwell Club, prepared his versions of the ginataan and kalamay sa latik using jekot, and risotto using chong-ak. Both chefs have been passionately promoting heirloom rice in their restaurants. The HRP is an initiative under the DA's Food Staples Sufficiency Program. With support from the various agencies of the DA and IRRI, this collaborative project aims to enhance the productivity and enrich the legacy of heirloom or traditional rice through empowered communities in unfavorable rice-based ecosystems. It holds the promise of becoming a remarkable endeavor for culturally rich communities in isolated regions of the world, particularly the hinterlands of Asia, Latin America, and Africa. New home for some busy honey bees. LOS BAÑOS, Laguna—Bees are highly beneficial insects and are normally harmless. However, bee colonies located in areas where people live, work, or play may pose a potential danger. Such was the case recently at the International Rice Research Institute (IRRI). Two nests of wild, native honey bees (Apis breviligula), commonly known as pukyutan, were located--one in a tree near IRRI's Blast Nursery and another in a tree near the perimeter fence of the research plots. 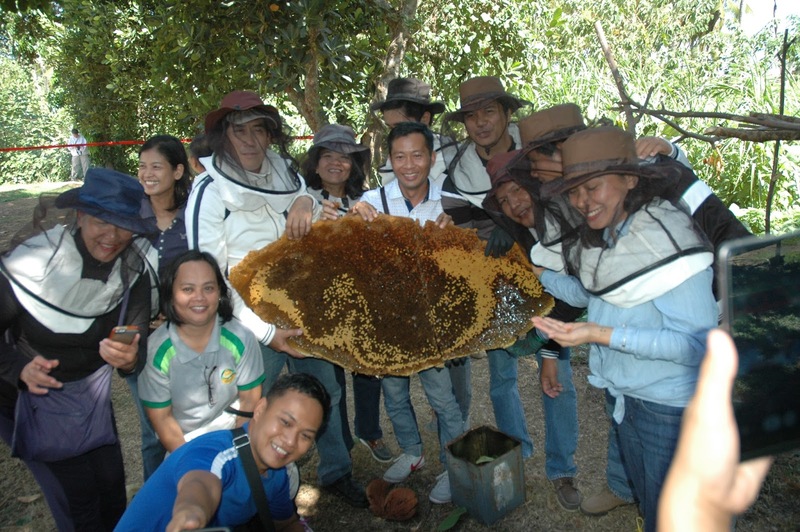 In keeping with the institute’s policy of farming with nature and respecting the environment, the Safety and Security Services, in coordination with the Institute of Biological Sciences at the University of the Philippines headed by Dr. Aimee Lynn Dupo, successfully relocated the bee hives to a safer location. The relocations were made on 9 April by the bee squad, a team of bee experts led by Alex Fajardo. They also harvested 8 kilograms of honey from the two hives. Each hive can produce approximately 20 kilograms of honey during a typical honey season. The presence of healthy bee populations is a sign of a clean environment with low levels of pollutants and toxic chemicals. IRRI has been working hard for many years to find sustainable, safer, smarter and more effective ways of managing pests. Through ecological engineering, the institute has reduced pesticide use at its experimental station. The reduction in insecticide use has also contributed to the rich diversity of birds living or passing through IRRI's rice fields. LOS BAÑOS, Laguna—Seventeen scientists and researchers from Côte d’Ivoire, South Korea, China, Germany, the Philippine Rice Research Institute, and the International Rice Research Institute (IRRI) participated in a training program for ORYZA version 3 at IRRI’s IT Learning Center. ORYZA is an important tool in rice research for that simulates growth and development of rice under a wide range of environments. The ORYZA model has become widely popular because users are confident of its output predictions that include yield, water and fertilizer use, and environment impacts on a variety’s performance. The training aimed to help the participants understand the structure and functions of the software as well as the essentials of the modeling—data preparation, setting of parameters, and cultivar parameterization, including interpretation of simulation outputs and analysis of different crop management scenarios. The five-day training program, which ran from 4 to 8 April, was conducted by a team of IRRI scientists and staff comprising of Dr. Tao Li, Olivyn Angeles, Man Marcaida, Mahlie Manalo, and Lolit Adriano. LOS BAÑOS, Laguna—A course on research data management (RDM 101) was held 29-31 March at the International Rice Research Institute (IRRI). The year's first course on the topic, it was conducted by the training team responsible for risk management and quality assurance and research data management (RMQA-RDM) at IRRI. RDM 101, held quarterly, covers research data planning; data collection, authentication, and analysis; data storage, backup, and security; and data archival and sharing. The training team also discussed and demonstrated file management tools and software including Beyond Compare, Cobian Backup, WinDirStat, Mendeley, Labfolder, Google Drive, and the IRRI Dataverse, which is an online repository for data archiving and sharing. Lea delos Reyes from Library and Documentation Services and Rogelio Alvarez from Information Technology Services delivered lectures on open access/open data and data backup, security, and storage. Attending the course (photo) were Dhananjay Gotarkar, Majid Mortazavi, Pauline Capistrano (GB), Jeffe Cadion (PB), Annalyn de Guia, Anaida Ferrer, Abraham Llave (CESD), and Shova Shrestha (NARC, Nepal). The training team is headed by Menchu Bernardo, IRRI-RMQA senior manager, and Enrico Francisco Mercado, senior specialist, research data management. 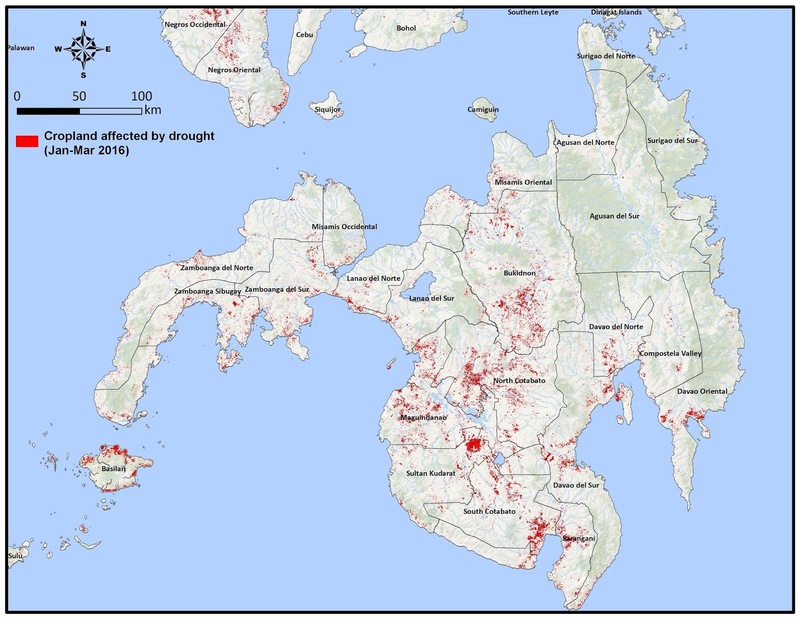 cropland in Mindanao affected by drought attributed to El Niño. MANILA, Philippines—Accurate, timely, and location-specific information on rice production is important in developing a national action plan to reduce the impact of El Niño and other events that can reduce rice productivity. “The Philippines has been experiencing El Niño for the past year,” said Allan Umali, assistant secretary for administration of the Department of Agriculture (DA), on behalf of Agriculture Secretary Proceso Alcala. "But the agriculture sector is still expected to bring food to everyone's table," he said. The El Niño–Southern Oscillation is a climate cycle in the Pacific Ocean with a global impact on weather patterns associated with droughts. The current El Niño, which started in 2015, was predicted to be strongest since 1998 and much lower rainfall is expected until the first half of 2016 throughout Southeast Asia. Although El Niño is predicted to wane, the United Nations expects harvests will continue to be affected not only in the Philippines but also in other parts of the world throughout the year. Philippine policymakers have put together an action plan on helping affected farmers mitigate the impact of the recurring climatic events such as El Niño. Among the recommended strategies in the plan include growing drought-tolerant crops, adopting water-efficient techniques, performing cloud seeding, among other climate-smart technologies. 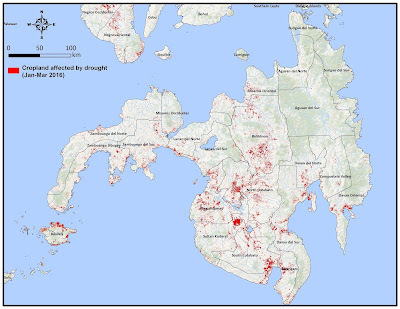 The Philippine Rice Information System (PRISM), a joint project of the DA and the International Rice Research Institute (IRRI), can also support strategic decision making and planning of interventions to boost rice production, targeting of productivity-enhancing technologies and programs, disaster preparedness and rapid response to emergency situations, among others. Through remote sensing, crop modeling, cloud computing, and smartphone-based surveys, PRISM can combine data from satellite and the ground to give crucial information about rice. These include rice area, planting dates, yield estimates, areas affected by flood or drought, rice crop production situation, and extent of damages caused by pests. Laborte reported that she and her team had developed a proposal on early warning system for pests and diseases so that appropriate and timely interventions can be made when and where they are needed. Senator Cynthia Villar, chairperson of the Senate Committee on Agriculture and Food, has recently proposed a bill that would require local government units to allocate a portion of their budget to pay for information and communication technology applications that would enhance taking full advantage of the data provided by PRISM. “Modern tools, mechanization, and financial literacy could help make Philippine agriculture more productive and competitive,” Villar said. Senator Cynthia Villar browses through PRISM website. MANILA, Philippines—“The benefits and advantages that the Philippine Rice Information System (PRISM) project had provided us so far cannot be discounted,” said Senator Cynthia Villar, chairperson of the Senate Committee on Agriculture and Food. “Thus, its continuation by the Department of Agriculture (DA) is utmost welcome. DA Secretary Proceso Alcala echoed Villar’s sentiments. “The project has already delivered remarkable outputs and showed great potential,” said Allan Umali, DA assistant secretary for administration, on behalf of Alcala during the PRISM Project’s first Annual Executive Meeting on 31 March. The event also marked the soft launch of the PRISM website (http://philippinericeinfo.ph), which will be available to project partners and policy-makers. PRISM is an on-going project led by the DA, Philippine Rice Research Institute (PhilRice), the International Rice Research Institute (IRRI), and sarmap. It aims to support decision-making toward improved rice production through an operational rice information system. It uses state-of-the-art technologies to provide accurate, detailed, timely, and location-specific information on rice. “The Philippines is the first in Southeast Asia to set up such an information system,” said Umali. Since 2014, PRISM has provided the DA with detailed data on rice area and yield every season at 85% accuracy, assessments of areas with standing rice crop, estimates of damages from typhoons, and standardized protocol and training of partners for assessing injuries caused by pests. Dr. Calixto Protacio, PhilRice executive director, added that the rice maps produced by PRISM can show planting synchrony, which affects the occurrence of pests and diseases, within a region. conference following PRISM's Annual Executive Meeting. Alcala also highly recommended the institutionalizationof PRISM within the DA, with PhilRice as its host institution. At present, PhilRice, IRRI, and DA Regional Field Offices (DA-RFOs) handle all PRISM operations. “The rice information system will be owned, operated, and sustained by the DA starting 2018,” said Dr. Alice Laborte, PRISM project leader at IRRI. “This will complement existing systems in the DA that guide strategy and interventions for food security at national and regional levels. “At the moment, infrastructures, including resources and personnel, have been mobilized and PhilRice will be able to set up the PRISM unit. This will be the center for all PRISM operations, processes, and maintenance,” said Laborte. Officials from the DA, DA RFOs, PhilRice, IRRI, the Bureau of Agricultural Research, Philippine Statistics Authority-Bureau of Agricultural Statistics, and the Bureau of Plant Industry attended the meeting to discuss the project’s accomplishments, outputs, and plans for its sustainability. LOS BAÑOS, Philippines—Hardy “super rice” varieties that can thrive even with less water, fertilizer, and pesticides will soon reach more farmers living in harsh locations in Asia and Africa under the third phase of the Green Super Rice (GSR) project. The GSR project, which formally launched its third phase at the International Rice Research Institute (IRRI) headquarters on 30 March to 1 April 2016, is focusing on bringing GSR varieties to farmers in Asia and Africa who are not only struggling with unproductive lands but are also exposed to the impact of climate change. In its previous phases, the project has released 55 rice varieties that can produce high and stable yields even with less water, fertilizers, and pesticides. Thirteen of these were bred at IRRI—11 were released in the Philippines and two in Pakistan. These varieties can also cope better with droughts, floods, salinity, and other conditions associated with erratic weather because of global warming. “Targeting new traits such as higher yield potential, more efficient use of fertilizer, and the ability to compete with weeds is just the beginning,” said Dr. Abdelbagi Ismail, IRRI principal scientist and coordinator, Stress-Tolerant Rice for Africa and South Asia. The project aims to decrease hunger and increase the food and income security of resource-poor smallholder rice farmers, particularly women rice farmers, in India, Bangladesh, Tanzania, Uganda, Nigeria, and Mali. In addition, small holder farmers in the Philippines, Indonesia, Vietnam, Pakistan, Laos, Sri Lanka, Mozambique, Ethiopia, Rwanda, and Senegal, and in Sichuan, Guangxi, Yunnan, and Ningxia provinces in China will also receive some support from the GSR project in phase 3. Atlin expects a very close collaboration, coordination, and joint planning among all BMGF investments at IRRI to integrate GSR into other BMGF-funded projects such as the Stress-Tolerant Rice for Africa and South Asia and the Transforming Rice Breeding. The two projects develop and deliver improved rice varieties to millions of farmers in unfavorable rice-growing environments. Ismail also called GSR a “unique project” for bringing rice germplasm from China in its breeding system. “These are distinctive in terms of adaptation and yield potential,” he said. Through the GSR breeding front established in 2009 at IRRI, the traits from the Chinese germplasm were incorporated into varieties that are suited for the tropical conditions of Asia and Africa, according to Dr. Jauhar Ali, IRRI-GSR project leader. “This year, there will be many more varieties from the Chinese germplasm will be released for the tropical regions,” Ali added. The inception workshop also featured the presentation of research activities by scientists from partner institutions. Dr. Lijun Luo, chief scientist at Shanghai Agrobiological Gene Center, discussed the GSR breeding activities conducted by the institution. Dr. Sibin Yu, the GSR project leader in China and professor at Huazhong Agricultural University, reported the major activities and achievements done by 27 partners within China funded by the China Ministry of Science and Technology. Dr. Baboucarr Manneh, the GSR project coordinator in Africa Rice Center, also presented the activities and achievements from their partner institutions in West and Central Africa. PALEMBANG, Indonesia—“Technologies that do not reach the people who are meant to use them are rather useless, that’s why the outscaling process is crucial,” said IRRI scientist Buyung Hadi. To fill the gap between technology and the farmers, a participatory video production training-workshop (photo) was conducted under the Give2Asia-funded capacity enhancement project for sustainable intensification of rice ecosystems in Indonesian outer islands. Twenty farmers and 13 research and extension staff of the Assessment Institute for Agricultural Technologies (AIAT)-South Sumatra participated. They learned the basics of participatory video production during a training-workshop on 28 March-1 April at the AIAT compound in South Sumatra. Dr. Harmanto, AIAT-South Sumatra director, expressed his appreciation to IRRI for organizing an activity that built the capacity of both farmers and AIAT staff. Also, he expressed hope that participatory outscaling methods will encourage more farmers to adopt rice-farming technologies. The event—the first of three training sessions—taught the participants how to create a storyboard, properly handle equipment, practice filming techniques, and conduct outdoor hands-on exercises in filming videos and interviews. The participants came up with multiple storyboards on various topics, such as trap barrier system, drum seeder, and mechanical transplanter. The participants showed eagerness and enthusiasm in learning “outside their comfort zone” and promised to come back to the next training session with video clips based on their storyboards. The farmers were from villages in tidal swamp areas where integrated best management approaches are promoted by CORIGAP (Closing rice yield gaps with reduced environmental footprint), an IRRI project that aims to increase farm productivity through environmentally sustainable ways. Mr. Budi Raharjo, head of the mechanization and postharvest division of AIAT and CORIGAP country partner, was instrumental in bringing the farmers and AIAT staff together. Trina Mendoza, an IRRI consultant, led the participatory video production workshop. She was assisted by Rona Azucena, IRRI communication specialist. VIENTIANE, Laos—The International Rice Research Institute (IRRI) sent a mission to Lao PDR seeking to reinforce its partnership and expand its role in increasing the country’s food and nutrition security. The mission followed up on a visit by a team of IRRI scientists in 2014 to build IRRI’s engagement with its national research partners, review the Lao PDR Rice Policy and Rice Sector Strategy, and identify technical assistance advice and expertise available to the country's agriculture sector. The IRRI mission team, headed by Reiner Wassmann, climate change specialist, included Michele Weldon, head of partnerships and development; Grant Singleton, coordinator of CORIGAP: Closing rice yield gaps in Asia with reduced environmental footprint; Leocadio Sebastian, regional program leader for CGIAR Research Program on Climate Change, Agriculture and Food Security-Southeast Asia (CCAFS); Digna Manzanilla, coordinator of the Consortium for Unfavorable Rice Environments (CURE); Yoichiro Kato, agronomist at CURE; and R.K. Singh, rice breeder. IRRI’s activities in Lao PDR have been supported by the International Fund for Agricultural Development, SDC, the Bill & Melinda Gates Foundation, the Australian Centre for International Agricultural Research, the Government of Japan, and Germany’s Federal Ministry for Economic Cooperation and Development. Collaborations between Lao PDR and IRRI began in the late 1960s. The long-term partnership resulted in the transformation of Lao PDR’s rice sector from pure subsistence to more commercial production. The country’s total rice production increased from 1.5 million tons in 1990 to more than 2 million tons in 1999, at which time the country achieved rice self-sufficiency. In 2012 and 2013, rice production exceeded 3 million tons, according to the Food and Agriculture Organisation. In 2007, the Lao PDR Ministry of Agriculture and Forestry and IRRI signed a memorandum of understanding establishing the IRRI-Greater Mekong Subregion office in Lao PDR, which is now the IRRI-Lao PDR office. In 2012, a study requested by the government reported that, as its rice production has achieved a sizable surplus, improving nutritional outcomes will increasingly depend on policies that promote higher household incomes and education about better diets. Research priorities identified by IRRI’s Lao partners focused on modernization, more resilience in the rice sector, and developing niche markets for their rice. Lao partners are concerned that they have been left behind as neighboring countries in the region have already started such efforts. “Our mission is to strengthen existing partnerships and establish areas for collaboration, as well as identify partners and potential donors who, in some cases, have not been aware of our long history of collaboration in the country,” said Weldon. LOS BAÑOS, Philippines—The Royal Government of Thailand is set to strengthen research and development ties with the International Rice Research Institute. The director general and senior officers of the Thai Rice Department (TRD) are at IRRI headquarters today (4 April) to further flesh out the collaboration with scientists. LOS BAÑOS, Philippines—The Philippine Rice Research Institute (PhilRice) and the International Rice Research Institute (IRRI) have been working together to breed and disseminate seeds of drought-tolerant rice varieties that can better survive the ongoing El Niño phenomenon. Rice farmers who are currently struggling with the effects of El Niño are particularly interested in drought-tolerant rice varieties. The ongoing El Niño is expected to cause much lower rainfall in the first half of 2016 throughout South and Southeast Asia, which includes the major rice-growing countries. “El Niño conditions will worsen livelihoods and may also lead to insufficient food supply for vulnerable farm households,” said Dr. Reiner Wassmann, climate change expert at IRRI. Scientists at IRRI have developed and released drought-tolerant varieties—those that can produce up to 1.2 tons more per hectare than varieties that perform poorly under drought conditions—in several countries, including Sahbhagi dhan in India and the Sookha dhan varieties in Nepal. In the Philippines, the drought-tolerant rice varieties available to farmers in rainfed lowland farms include Rio Grande, Sacobia, and 12 varieties of Sahod Ulan. Drought-tolerant rice varieties for upland farms include Pasig, Apo, and Katihan 1. In addition to climate change-ready rice varieties, IRRI has also developed water-saving technologies such as alternate wetting and drying (AWD). AWD is regarded as one of the more important rice cultivation methods that can dramatically save freshwater irrigation.